Flour is grains that have been dried and ground into powder. 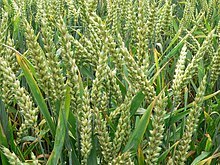 It is usually made of wheat, but can also be made from many other grains, nuts and other substances. Flour is used to make many foods. Flour can also be made at home. Some people like to make flour at home because when flour comes from the factory, the outer shells of the grains have usually been removed. The outer shells have fiber which is needed for metabolism. Flour has many nutrients. You can even make flour out of things such as pumpkins, pumpkin seeds, brown and white rice, wheat, etc. ↑ "What is self-rising flour?". Baking Bites. 2 August 2007. ↑ Priya Johnson (29 August 2012). "Self-rising Flour Vs. All-purpose Flour". Buzzle.